Jean Grossman, CPC is a Senior Consultant for Leath Group, LLC—a dynamic curriculum development and intellectual property greenhouse that grows leaders and shapes cultures. She is also a consultant for London-based Primeast, and today has more than 40 years' experience as a management consulting professional specializing in Organizational Development. During these years, she has effectively transformed organizational goals and project requirements into actionable strategies, programs, and operational objectives in the profit and non-profit realms. Jean’s extensive experience has always focused on creating and delivering programs and projects focused on more effective and efficient use of operational resources, while ensuring client needs are met. She is a motivated, organized, and results-oriented individual who readily facilitates credible communication with all constituents. Her prowess in meeting facilitation, project management, technical writing, and business process re-engineering ensures that team members operate at peak levels. Representative clients include BASF, ExxonMobil, Mobil Oil, Raytheon Professional Services, Software AG, Youth Mentor Network, TXU Energy Retail, Leadership America, Pioneer Natural Resources, SemperCare Hospitals, Inc., Texas Health Resources, APA Petroleum Consultants, Inc., Countrywide, and Northwest Airlines. Jean’s work for these organizations has included facilitating the design of a documentation database, developing methodologies for a PMO, organizing managers and high-level technical personnel to optimize team performance, improving customer experiences, and managing multi-million-dollar projects. Clients consistently praise Jean for her exceptional research, analysis, communication, and problem-solving skills. Jean is a conceptual and holistic thinker able to bring awareness of the essential meaning of variables, ideas, and options as they relate to the big picture. A lifelong learner, she is constantly pondering the meaning, purpose, potential, and destiny of people. This has been exhibited through her role as a mentor for the past 15 years, working initially with students at the University of North Texas in its Professional Leadership Program and most recently with select Professional Advancement students at Prep for Prep, a non-profit organization serving promising students of color in New York. With her strong sense of personal responsibility to influence good, growth, and gain in the lives of those she serves, Jean uses her intuition and philosophical curiosity to bring awareness of personality, intentions, emotions, ethics, and values. She is open-minded, curious, creative, and innovative—and often applies these traits to meaningful community development opportunities. 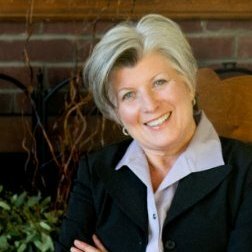 She is motivated to influence and convince others to participate in social, organizational, vocational, or recreational activities, including a project with fellow Master Gardeners to install a learning garden at a local environmental center and in her position on the Board of The Land Conservancy of New Jersey. Jean resides in her native New Jersey and lives with her cardiologist husband, Steven, where she continues to coach and has worked on a 21st Century Community Kitchen in Newark that brings healthier food options, job training, and food production to the inner city. She is the proud mother of James, a graduate of Hofstra University.